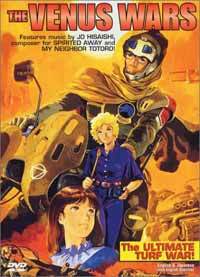 Notes: Based on the manga by Yoshikazu Yasuhiko. In the future, the earth will be so overpopulated that humanity will be forced to colonize other planets to meet its needs. One of the planets that is colonized is Venus. Venus is marked by constant warring as different nations vie to be ruler of it. Hiro, a demolition derby motorcycler, was just minding his business when the nation of Ishtar moved in on the city. Nevertheless, he becomes actively involved along with his friends in the fight to regain Aphrodia's (his home nation) freedom. There are other participants that are sucked into the action as well, including the headstrong journalist Susan, the cynical war vet, some generic idiot youths, and other uninteresting characters. Well, as you could tell from the synopsis, this movie didn't do much for me. Maybe it was the Sci-Fi channel mangling of this one, or the awful dubbing, or because it was overcompressed from the original manga (haven't read it, so it's just a guess), but this was, in my opinion, a very poorly executed movie. While the animation and art aren't all that bad (adequate, although there's a laughably bad attempt to superimpose animated images over a real background), and the score isn't TOO bad (at least, I can't remember any complaints), the plot seemed really choppy and incomplete in a lot of places. Things just sort of happen, with not too much in the way of explanation. There are a bunch of characters, some of which could have been really interesting, but none of them are ever really developed. As a result, I end up not really giving a darn what happens to any of them. Some defenders claim that this style is a realistic portrayal to how war affects everyone, but I've seen good war films that still make you care about the characters. The premise was promising, but it collapsed into more sci-fi cliches with the motorcycle demolition derby and the over-emphasis on how different life is on Venus than on Earth in the dialogue. And the resolution was quite sudden, with little explanation as to just how Ishtar was vanquished (yeah, it was vanquished. Sorry to spoil the ending for you). All in all, an utterly unengaging watching experience, although it wasn't an abject failure. But not a success by any means. Recommended Audience: Some adult themes in this one, as well as some quasi-graphic violence when the local police rough up Hiro. Not for younger audiences.